Fitzrovia’s FOLD gallery focuses on presenting in-depth solo exhibitions from emerging to mid-career artists, whose work challenges conventions. The title of its latest show – Tectonical – might bring to mind moving plates, boiling magma, volcanoes and other geological processes relating to earth’s structure, but tectonics is also a term used in the eld of architecture. With tectonics defined by the gallery as ‘the science or art of construction, both in relation to use, and artistic design’, the exhibition showcases work by two artists, Asmund Havsteen-Mikkelsen and Florian Schmidt that explores how architecture is assimilated into the modern world. Havsteen-Mikkelsen’s work brings a poetic and painterly perspective to the physical realm of construction. 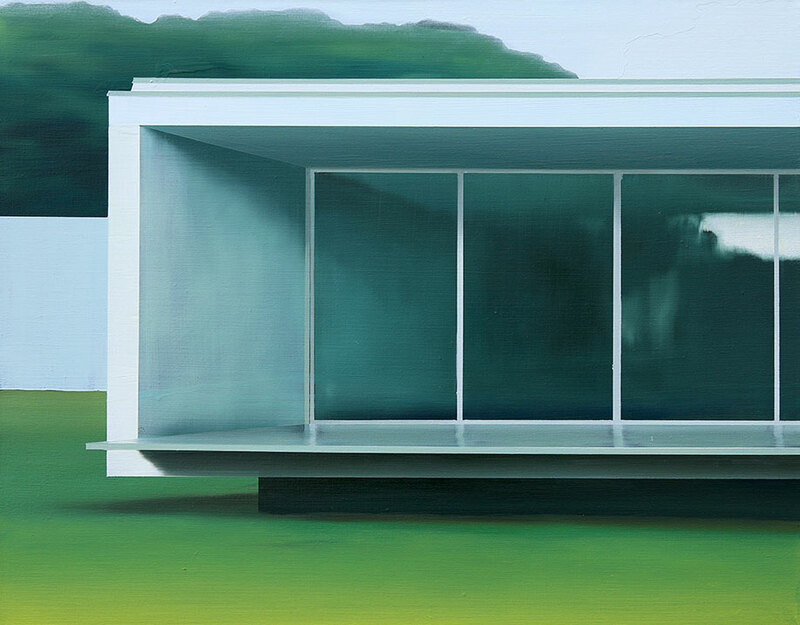 His stark paintings are largely inspired by photography and models of real structures, as well as by the work of the Tecton Group and one of its founders, Russian émigré Berthold Lubetkin. Lubetkin was influenced by Russian Constructivism and pioneered Modernist design in Britain. His group’s commissions included the Penguin Pool at London Zoo (interpreted by Havsteen-Mikkelsen in his 2015 painting I Will Meet You Halfway), as well as the now Grade I-listed Highpoint development in Highgate, and Finsbury Health Centre, which at the time it was built presented a utopian ideal of accessible healthcare. Schmidt’s work on the other hand, traverses the oeuvre of art history more broadly, employing the artistic language of abstraction and realism in his two- and three-dimensional pieces. Geometric shapes, often in cardboard or wood, emerge in layers from the canvas, lending an architectural aspect to the paintings.